Approximately 6.1 million children have been diagnosed with seasonal allergies, according to the U.S. Centers for Disease Control and Prevention. In an effort to snuff out children’s spring allergy symptoms, many parents resort to over-the-counter allergy medications. But the task of choosing an allergy medicine for kids isn’t always easy. Findings from the C.S. Mott Children's Hospital National Poll on Children's Health revealed that many parents struggle to navigate the wide range of allergy medications. "Parents often face an overwhelming selection of allergy medicine without clear guidelines on how to choose the right one for their child," said poll co-director and pediatrician Dr. Gary Freed. "Some parents may be picking allergy medication based on their interpretation of different advice they've heard, which may not always be accurate," Freed said in a statement. Dosing and labeling differences also have a tendency to trip parents up. More than one in five respondents said they’ve had trouble determining the right dose of allergy medicine for their child. Fifteen percent of the 1,066 parents surveyed admitted to giving their child medicines labeled for adults. But while adult medicines often contain the same ingredients as medicines for children, the researchers note that they don’t always have dosing instructions specifically for little ones. Giving kids the correct dose of over-the-counter allergy medicines is crucial to ensuring their safety and efficacy, said Freed, who pointed out that “doses greater than recommended for children can result in more severe side effects." Instead of heading to the store to pick up a new allergy medication for their child, 85% of parents used medications they already had in the house. One in five (18%) parents surveyed didn’t check the expiration date prior to giving the medication to their child. "While outdated medicines are unlikely to be dangerous, they may have lost some of their effectiveness," Freed said. Read the ingredients. Check the ingredients list on the box to see if the product has ingredients that can alleviate your child’s symptoms. 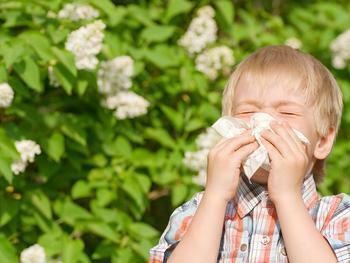 For example, antihistamines can help with a runny nose and itchy eyes while decongestants help with a stuffy nose. Double check the dosage. Be sure not to give your child an adult dose of medication. Consult a doctor. Almost a third of parents (32%) said they seek help from a friend of family member when choosing allergy medication for their kids. But Freed says doctors should be parents' top source of advice about allergy medicine. "If parents are unsure how to navigate allergy medication choices, they should always check with their child's health-care provider," he said. Does your pet have springtime allergies?